The very first time I had a piece of Pavlova was about 10 years ago when I lived in Singapore. It was the “love at first sight” experience. I would say “Delightful” was the exact word that I could describe when I had the first bite. Without knowing much of its history behind, I was quite confused where Pavlova was originated. I heard from both Australian and New Zealander. And I, soon, learned that you don’t talk about the origination of Pavlova when the both nationalities present at the table. This melt in your mouth dessert was believed to be created to honor the famous Russian Ballerina, Anna Pavlova. 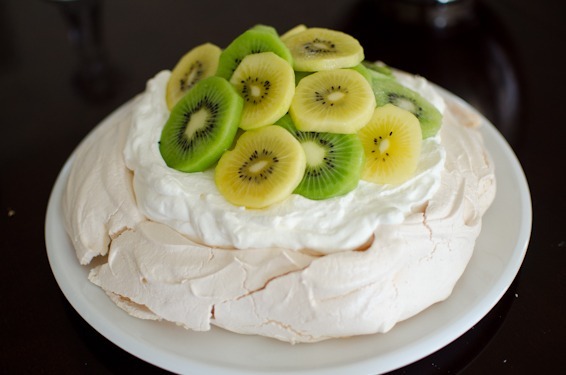 Pavlova is basically meringue pie topped with cream and fresh fruits, usually various berries and kiwi. 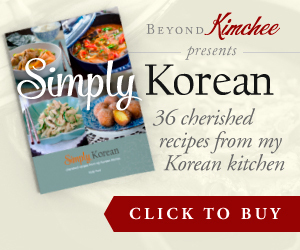 It is a velvety smooth, creamy and refreshing dessert. Perfect for a sunny summer day! I wanted 8 inch round Pavlova, so I draw the circle on the parchment paper by using 8″ cake pan. 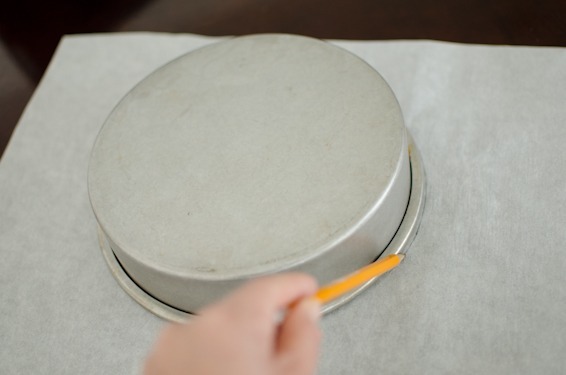 Place the parchment paper on the baking sheet with the pencil marked circle facing down to the pan. Slowly adding the sugar whip the egg whites until the soft peak forms and the sugar is no longer gritty when you touch the egg whites. Add the vinegar, corn starch, ad vanilla. Whip until you get the stiff peak like this. Spoon the meringue on the parchment paper using the pencil mark as guide. Bake in the preheated 250˚F (130˚C) oven for 75-90 minutes until the meringue is dry to touch. 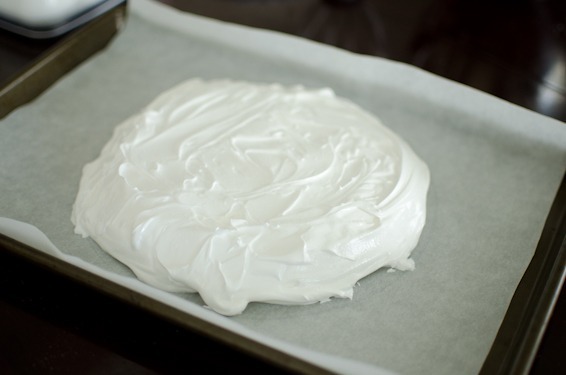 Turn off the oven, and keep the oven door open slightly and let the meringue to cool completely inside the oven. 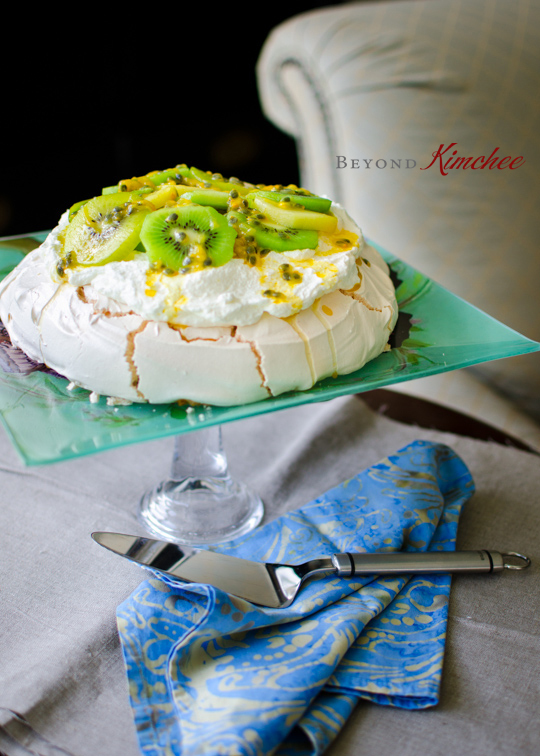 Carefully transfer the meringue to a serving platter, and top with sweetened cream and kiwi slices. Berries and other type of tropical fruits would be great, too. 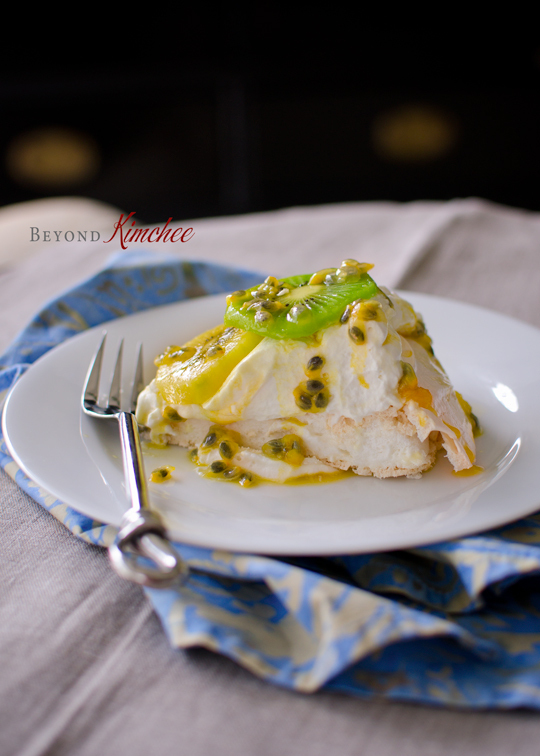 I just love my pavlova with kiwi fruits. As you can see, unfortunately mine got cracked as I was placing on the platter. But it is okay! I think it adds its own kind of charm if the meringue got cracked. Agree? Here is my favorite part of Pavlova. The passion fruit! 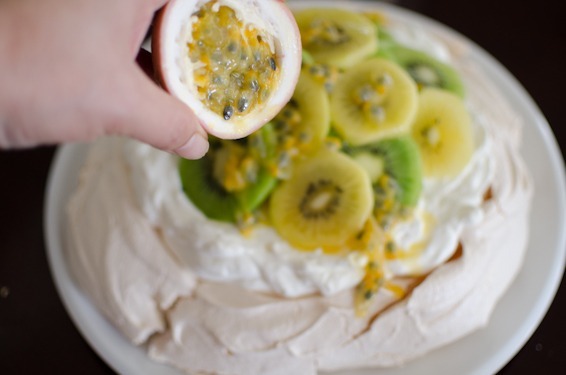 If you can get some fresh passion fruit, drizzle the pulp over your pavlova. 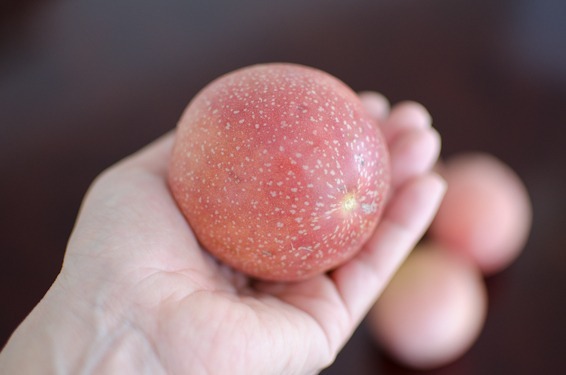 You might be able to find canned passion fruits in a specialty store. It brings such a lovely flavor to this divine dessert. The sun is beautiful outside today. And I hope this beautiful dessert will bring a taste of heaven. Have a good day! 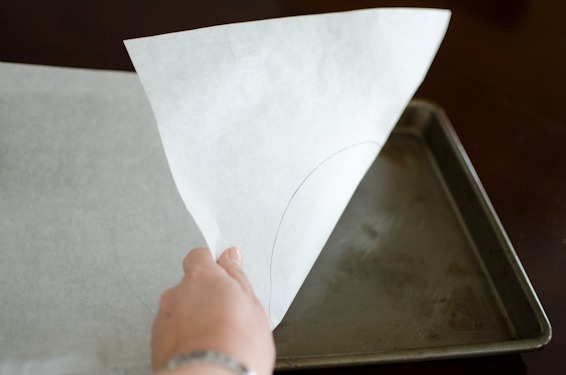 Draw 8-inch circle on a piece of parchment paper. Line a baking sheet with the parchment paper with the circle mark facing down to the baking sheet. Whip the egg whites adding the sugar a little bit at a time until the soft peak forms. 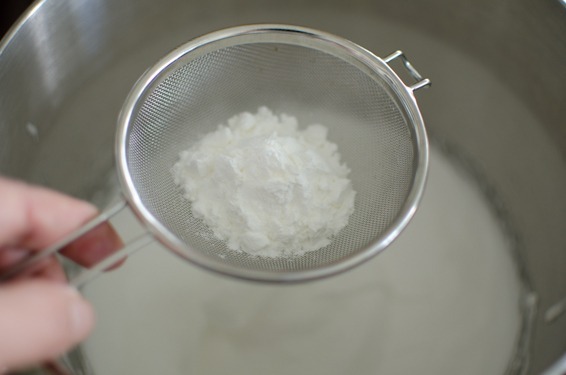 Add the corn starch, vinegar, and vanilla extract and continue to whip until the stiff the peak forms. Spoon the meringue on the baking sheet using the the circle as a guide line. 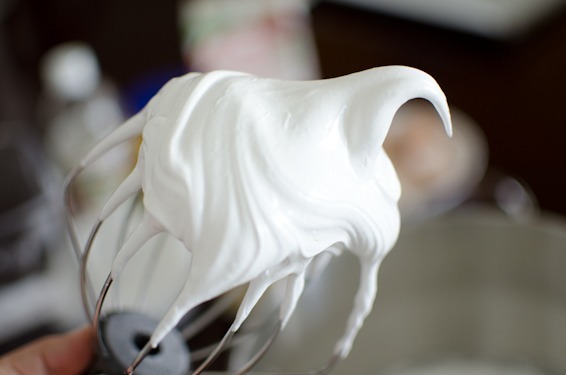 Bake the meringue for 75-90 minutes until it is dry to touch. 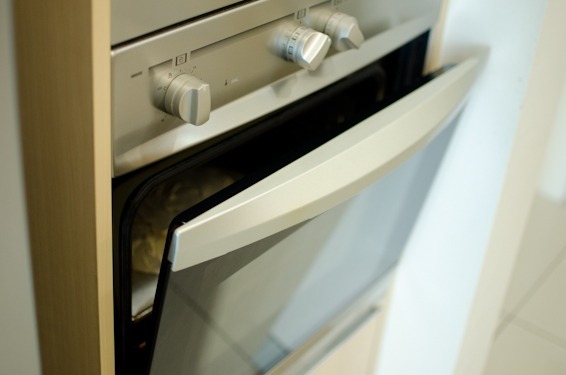 Cool the meringue in the oven completely with the oven door slightly open. Store the meringue in an air tight container until ready to use. 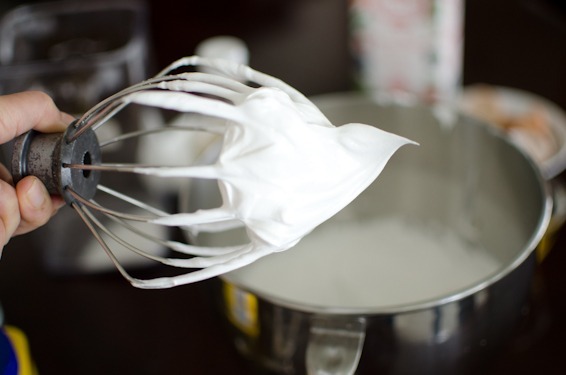 For the whipped cream, whip the heavy cream with sugar and vanilla extract until it forms soft peak. 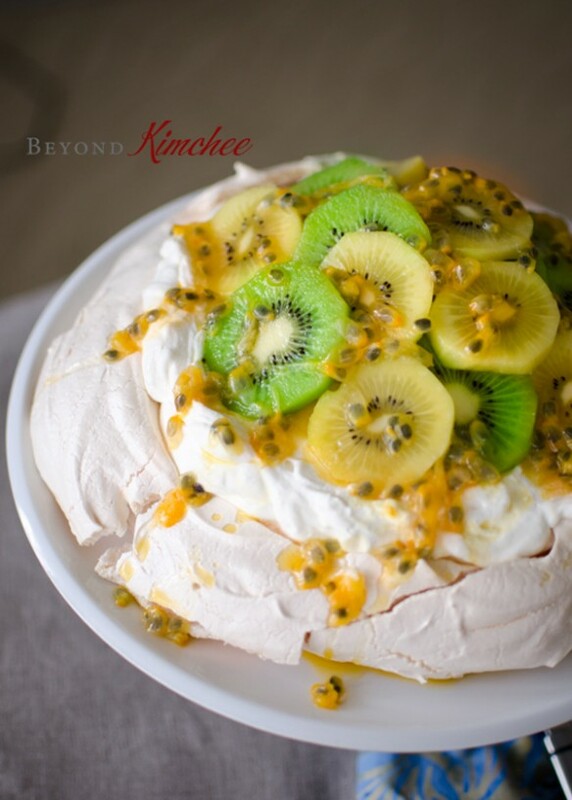 When ready to serve, top the meringue with the whipped cream and kiwi fruits. Drizzle with the pulp of passion fruits. Enjoy! I always love a good pavlova! Love the fruit in yours -- such terrific flavor. Plus it's gorgeous -- what a wonderful dessert! Thanks for this. this is a seriously delicious looking pav! you can never go wrong with kiwi and passionfruit together. definitely craving a slice right now! Hi Holly, how's it going? This pavlova looks awesome. Only if you were here!!! We all miss your cooming so much. We are about to leave and we are about to buy another car, lots of shopping for baby stuff and grocery items just like you went through. I guess this will be our lives for the next two decades : ) better enjoy it than stressing out. Lol. 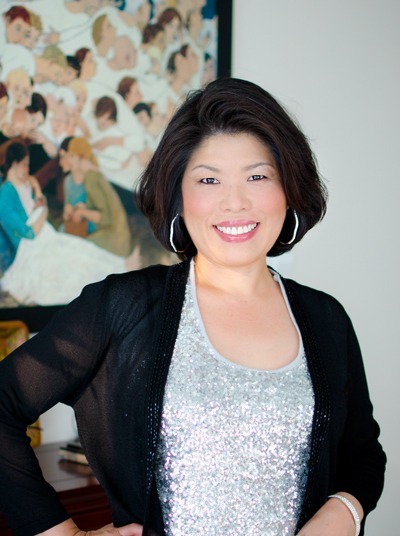 Hope you are doing wonderful. I just wanted to say hi. Milo named one of his toys Preston lol. Have a good one!! This looks so perfectly sweet. The better thing is the sour taste from kiwi. Great photos always!